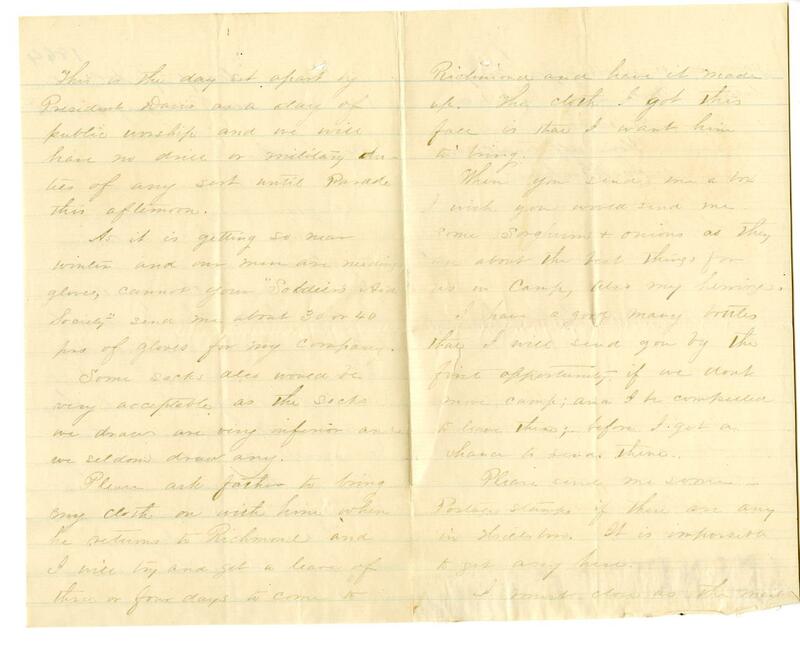 Item Description: A letter from James Graham to his mother. James Augustus Graham was an officer stationed in Virginia and South Carolina during the war. 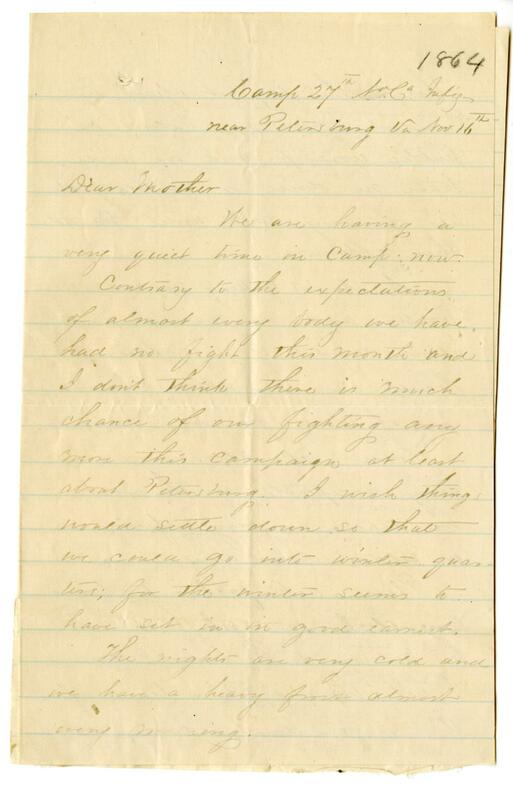 In this letter he requests items for his troops. It reveals a lot about what the soldiers needed during winter months. Item Citation: From Folder 3, in the James Augustus Graham Papers, #283, Southern Historical Collection, The Wilson Library, University of North Carolina at Chapel Hill. We are having a very quiet time in camp new. Contrary to the expectations of almost every body we have had no fight this month and I don’t think there is much chance of our fighting any more this campaign at least about Petersburg. I wish things would settle down so that we could go into winter quarters; for the winter seems to have set in in good earnest. The nights are very cold and we have a heavy frost almost every evening. This is the day set apart by President Davis as a day of public worship and we will have no drill or military obletes of any sort until Parade this afternoon. As it is getting so near winter and our men are needing gloves, cannot your “Soldier’s Aid Society” send me about 30 or 40 pairs of gloves for my company. Some socks also would be very acceptable as the socks we draw are very inferior and we seldom draw any. Please ask father to bring my cloth on with him when he returns to Richmond and I will try and get a leave of three or four days to come to Richmond and have it made up. The cloth I got this fall is that I want him to bring. When you send me a box I wish you would send me some sorghum and onions as they are about the best things for us in camp, also my herring. I have a good many bottles that I will send you by the first opportunity if you we don’t move camp; and I compelled to brave tem; before I get a chance to send them. Please send me some Postage stamps if there are any in Hillsboro. It is impossible to get any here. I must close as the mail came. Is waiting for my letter. Write soon. Love you. 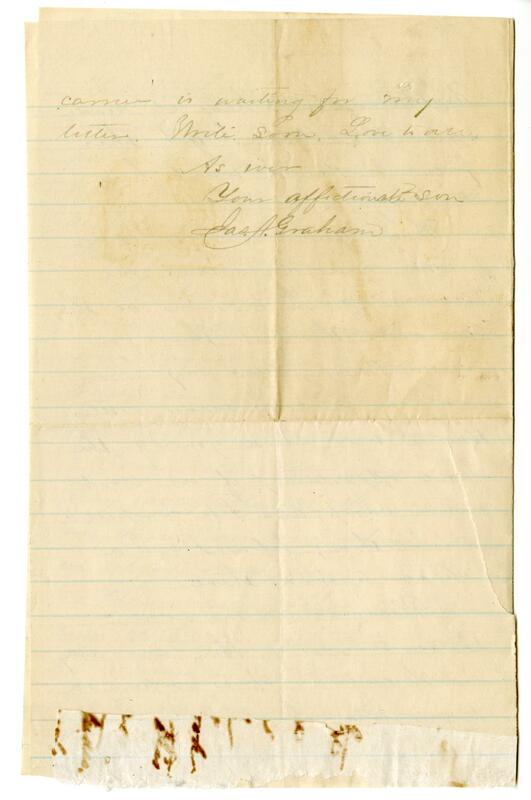 This entry was posted in Southern Historical Collection and tagged Civil War, Confederate Army, food, gloves, Petersburg, Richmond, socks, supplies, winter. Bookmark the permalink.